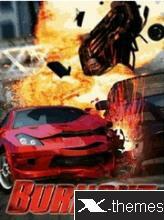 Description: Take the ultimate driving game on the road and create carnage wherever you go with Burnout on your mobile. Grab the wheel and hold on tight as you take down your rivals at adrenaline-fuelled, retina-searing speeds. Leave the rules of the road trailing in your wake and use your car as a deadly weapon to crush the competition, causing the most spectacular smashes ever seen in a mobile game. It's not about crossing the line first, it's about making sure your rivals never get there! how can I install it on my phone when it's no .jar file?